Innovative New Interactive “Harry Potter” Dark Ride Coming to Universal Orlando? Recently, there have been rumors floating around regarding a possible new addition to Universal Orlando’s Islands of Adventure. Between the recent acquisition of the film rights to the Harry Potter franchise and the the newly uncovered patent, these evidences provide support that assists in substantiating these rumors; however, there has yet to be a formal announcement. This possible new addition brings up some issues to consider. Already, there are park regulars who are not welcoming this decision. Why not? 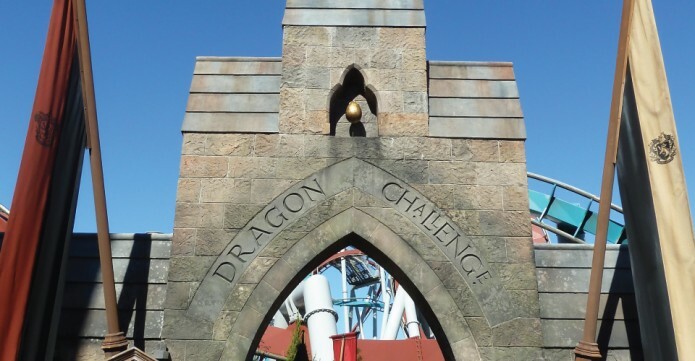 Because Universal would tear down the Dragon Challenge (formerly Dueling Dragons) roller coaster in Hogsmeade and replace it with an interactive dark ride that would enable park guests to test out their technique and spells. Think Toy Story Midway Mania but perfected and with an increased experiential factor. Even before this rumor, Universal is increasingly being thought of as a theme park overrun with 3D screen attractions. Anecdotally, this is an accurate observation since the most recent additions to the park are all on similar ride platforms (just with different thumbing). One of the elements that I have researched is the requirement that the park guest experience physical movement and be emerged into a psychical atmosphere that transports the guest from the real world into a world of fantasy, adventure, or horror. Although this new ride sounds impressive and innovative, it bears a striking resemblance to many of the attractions that already exist. While no one would really complain about an indoor attraction, as Florida is notoriously hot and humid more than half the year, the concept of a ride moving in front of 3D screens does not appear to be eliciting the response that was intended. One of the primary elements that separates a theme park from an amusement park is the concept of continuous storytelling complete with proprietary theming. While amusement parks build more rollercoasters and other visceral thrill rides, theme parks create thrilling atmospheres and experiences. It’s a fine line. Take Cedar Point v. Walt Disney World for instance (while ignoring the former’s seasonal operation). Both parks offer amusement, thrill, and entertainment; yet, they are both vastly different experiences. Remember in geometry: while both are polygons, every square is a rectangle but not every rectangle is a square? That principle applies to this analogy as well with WDW being the square and Cedar Point being the rectangle. What makes the difference? Intellectual property, theming, and story. If one were to total up the number of roller coasters or traditional thrill rides at both Cedar Point and WDW respectively, obviously Cedar Point’s numbers would dwarf WDW’s. That’s because the focus of the park experience is different at both places. The focus of Cedar Point is on the thrill while the focus at WDW is the experience (or immersion). The former does not adhere to any cohearant or continuous theming while the latter has built a vast empire on theming and story. A similar argument can be made with cinema. Literary and cinema researchers Linda Williams and Geoff King both write about narrative vs spectacle. 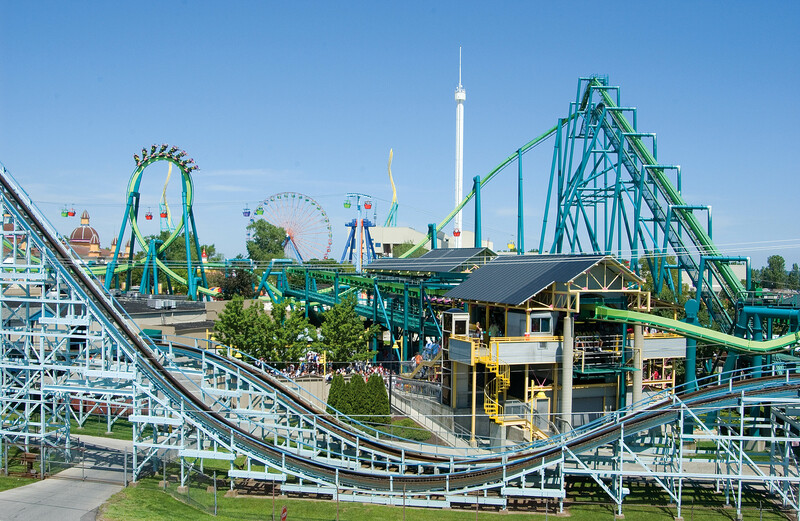 Amusement Parks like Cedar Point are almost entirely focussed on the spectacle of the park experience while WDW concerns itself more with the narrative of the experience (although, WDW does strike a balance between the two). Much like WDW, Universal Orlando Resort (and Universal Studios Hollywood) seek to create a thrilling atmosphere complete with rides, shows, and a high caliber experiential factor. Whether it’s the story OF the movies or about the stories told by cinema, Disney and Universal Parks transport the park guest from reality into fantasy. So, what does all that have to do with this possible (but likely) new Harry Potter dark ride at Universal’s Islands of Adventure (IOA)? A lot, actually. The controversy or concerns seem to stem from Universal’s trend away from physical to virtual environments. Not that 3D/virtual environments aren’t accompanied by the physical. For example, Escape from Gringotts pairs simulated elements with physical production design; however, there is a measurable trend to relying heavily upon 3D IMAX screens as opposed to tangible production design. A great example of this trend is the new King Kong attraction at IOA. The outside of the show building and the queue are impressive. It looks and feels just like you are a character in the movie–cool right? After you pass through the massive gates to Kong’s jungle, the attraction is 75-80% 3D screens. Likewise, the Transformers attraction at Universal Studios Florida/Hollywood is also comprised of mostly 3D screens. Losing a traditional roller coaster in exchange for another 3D dark ride could likely rub some park guests the wrong way. Although park guests of the Disney and Universal Parks are there for the experience, story, and incredible themed design, this does not negate the desire for more traditional amusement within these worlds of fantasy. 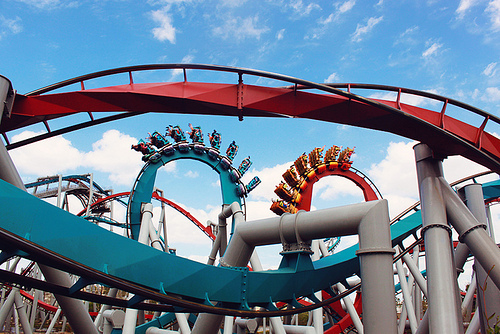 Looking at the parks of Central/West Central Florida, it is clear that Busch Gardens has the largest number of roller coasters, and there are many park regulars, including myself, who go there for the traditional thrill rides. On a side note: I also find the methods Busch Gardens integrates the animal encounters and experiences outstanding–best of what a zoo and amusement park offers. Anyway. With Universal possibly removing a roller coaster that can cycle guests very quickly (due to the two tracks of Fire/Ice) and replacing it with a greatly mitigated cycling attraction like a 3D dark ride, it could prompt longer waits for a similar experience (Transformers v Spider-Man) that can be had at the other 3D attractions. Another forecasted closure in the near future is Revenge of the Mummy. Again, this is a popular traditional (indoor) high speed roller coaster that may be replaced by a 3D style attraction. Even though Universal and Disneyland has to work around issue of being land-locked when planning expansions and improvements whereas WDW has geographic room for expansions, is replacing traditional roller coasters with 3D dark rides the way to go? I am totally excited for expansions to the Wizarding World of Harry Potter (WWHP) in light of the film rights acquisition and the new movies. I am even more excited to see additions made to the parks that I frequent the most! However, I don’t believe it best planning to sacrifice more traditional rides. The best solution would be to design an attraction that would provide a platform for gusts to test out their magical skills while experiencing the visceral thrill of a coaster type ride. As with all industries, theme parks too have to change with time and with the desires of those who buy the tickets. Theme parks are a business model usually owned by media conglomerates. If the addition of 3D attractions is what increases revenue, then that is the decision that is to be made. The business of filmmaking is also very similar in that respect. I hope that the possible new attraction is one that breaks the mold of the typical 3D screen moving ride and reaches new innovative design heights! We will just have to wait and see and we learn more about these upcoming changes.